Love, Mrs. Mommy: How To Make Co-Parenting Work! How To Make Co-Parenting Work! This is a Guest Post by Noémi from CoParents.com. I only share information with my readers that I find interesting, helpful or fun! Raising a child with someone you don’t live with can be quite challenging. Whether this is the result of a divorce, a separation or a personal choice, co-parenting might be demanding and hard to manage. Don’t worry, though, with a good organization, the necessary arrangements – sharing custody, coordinating schedules, agreeing on a set of rules, as well as ensuring the welfare of the child - is perfectly realizable. Although the nuclear family – a married couple living with their children – remains the most common family type in our society, this is not the unique model anymore. Today, you can find single parents raising a child on their own, gay parents, extended families, and people who decide to have a baby without living together and being in a relationship. This latter is called co-parenting. Couples who split or divorce might also choose to co-parent and share the rights and responsibilities in relation to their children. 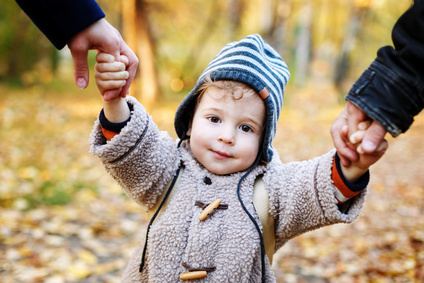 Co-parenting is a form of partnership where both parties work jointly in order to ensure that the welfare and the needs of their child are preserved. The most important thing is to maintain a stable and safe environment to the child. His or her well-being is always the priority and every decision must be made accordingly. Living in two homes might be quite confusing for a child, especially after the separation of their parents. They need to carry on the same routine whether they stay at mom or dad’s house. Children must evolve in a stable environment to feel secure. For this reason, both parents should arrange a common set of rules for the two houses. The discipline, homework, dining and bedtime hours, or also the amount of time spent playing computer games, should remain the same. Children love their mommy and daddy equally. They need to continue to have a healthy relationship with each of their parents. Arranging shared custody, for instance, a week with mom and a week with dad, is a good solution for a child to spend time with his parents and feel close to both of them. Shared parenting should be arranged according to the age of the child as well as their personality. When co-parenting is the result of a separation, it might be hard to preserve a good relationship with the ex-partner. However, the well-being of the child should always be the very top priority. Even if you feel resentment towards your ex, keep it for yourself and never show it to your child as these negative reactions could hurt him or her. On the contrary, if your children see their parents respecting each other and even better, enjoying having a little chat, they’ll feel more comfortable with the situation. Having regular conversations with your co-parent is essential to maintain a good relationship as well as to make shared custody a success. Additionally, the person who has the custody should always share with the other parent about what happens during these few days. Problems at home, a birthday party invitation, a good mark at school, or any other kind of events that might be relevant, are important things to say to your partner. Both parents must feel fully involved into their child’s life. Children who see their parents happy will be cheerful too! Can be so hard!! Especially if you have difference in opinions and beliefs!! But can definitely be done :) You are so right that communication is key! I wish my ex would have read this when children were younger.